I was one of a handful of editorial contributors to the HUGO BOSS-sponsored Red Never Follows project. The exhibition presents twenty creatives at Saatchi Gallery in London, celebrating HUGO’s 20th anniversary, later this month. Here is the full text I wrote for the catalog with added illustrations, as I think it gets to the heart of what CDM is about. (Article as published on their site.) The examples naturally relate to artists selected for the exhibition, so they represent a small fraction of what I believe is a web of interconnected artists worldwide. And since it’s for a more general audience than CDM usually reaches, feel free to pass it along to friends if it says to you, yes, this is what we’re doing. -Ed. Twenty years ago, people still called digital media “new media.” Now, digital is no longer new. Newness is in the hands of the artists. It is an expression of artistic individuality, a force of personality and fancy, as much as technological novelty. Digital media itself has made the leap from new to native. A generation of artists has grown up with digital media as ubiquitous as tap water or electricity. Those who refuse to follow preset culture use that ubiquity to invent original new forms rather than copy and paste old ones. They reimagine artistic roles in ways that become as fluid as the media and information around them. Music, sound, picture, scenography, architecture, and engineering fuse into inter-disciplinary design, physical practice with screen practice. It wasn’t always this way. Early experiments in fusing computation and creativity were clunky at best. Very often, research would literally pair a white coat-cloaked engineer with a shaggy-haired artist, hoping the two could somehow sort out a way of working together. Now, instead, artists speak in the language of code – no lab coat required. They’re making their own software tools, written in textual code in tools like Processing and OpenFrameworks, or by connecting modules into visual webs called “dataflow” or “patching” environments like Max and Pure Data. They engineer their own hardware, and never shy away from making physical things. Jeongmoon Choi. Photo (CC-BY-SA) János Balázs. Daito Manabe is a perfect example of the lines now connecting body and machine, number and tune. The Japanese artist has long taken on overlapping labels – DJ, VJ, musician, visualist, engineer, designer – while making ephemeral media physical. A vibrating chaise longue made the output of a turntable something that could be felt; a set of Nike running shoes became trigger inputs for samples and effects, a musician bending their soles instead of turning a knob. In his latest work, this link to the body becomes more explicit. A drum machine connects to a face by electrodes, small shocks causing twitches in time with the music. A music video for FaltyDL turns twitching hands and arms into a dance that grooves with the song. Manabe is quick to point out that electro-stimulation techniques date back to the 1850s, but it seems that today, our dialog with our machines makes it more vital. And by spinning his inventions into videos and performances, Manabe takes turns as video artist, DJ, and bio-feedback scientist. The electrode-stimulus pieces grew out of a collaboration with a dancer. So, here, it’s appropriate to see Manabe’s talents turn to the touchless Kinect input, again returning to dance. Whether voluntary or involuntary, these are ultimately works around choreography. 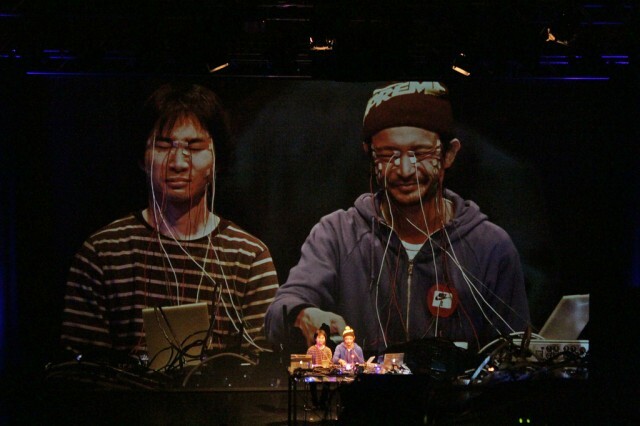 Daito Manabe is part of an international tribe of hackers working in reinventing human/machine interface designs. That tribe extends to developer/artists like Kyle McDonald, who has produced innovations from 3D printing and scanning to computer vision, and who shares his code and techniques with an open source community. It is also peopled by makers of new fluid interfaces, such as the fly-through 3D audiovisual environments AudioGL (by Jonathan Heppner) and Subcycle (Christian Bannister), which fuse visualization and musical compositional interface into Holodeck-style navigations of abstract geometries in space. 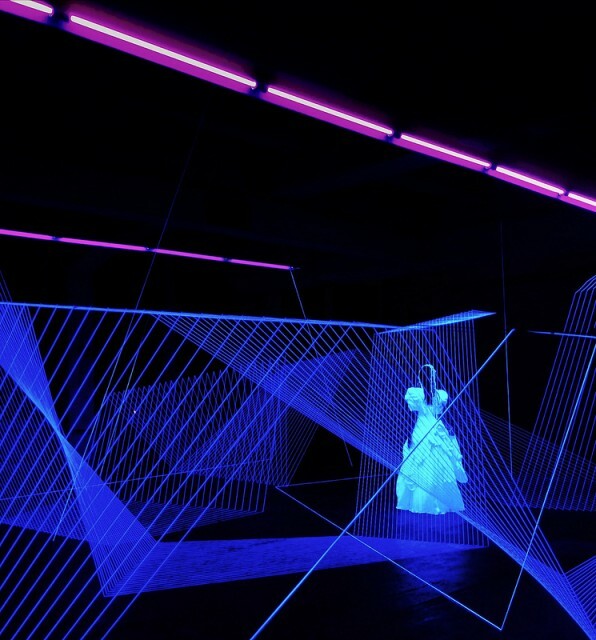 Jeongmoon Choi’s work is a kind of immersive scenography, light and color extended to exquisitely-delicate spiderwebs of string. Trained in painting, the Seoul-born artist now describes her work as “drawing in space.” Brilliantly-illuminated lines criss-cross volumes in a theater of light, part sculpture, part architectural. 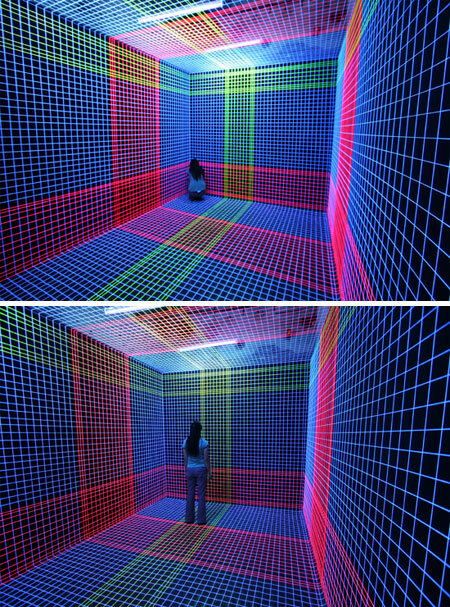 It is the virtual world of geometry projected into physical space, back to the scale of humans. Choi talks about growing up in closed quarters; she has created for herself a larger, meditative environment. IDOMENEO | operatic staging from urbanscreen on Vimeo. IDOMENEO | behind the scenes from urbanscreen on Vimeo. 26th Floor | Augmented Sculpture from urbanscreen on Vimeo. 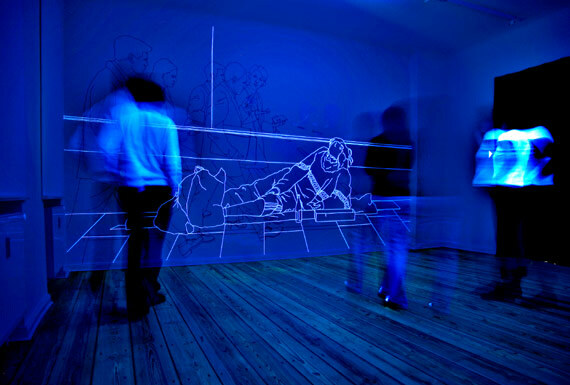 Echoing that blurred boundary between light and sculpture is URBANSCREEN from Bremen, Germany. Part of a growing tribe of artists embracing mapped projections, the collective augments space and form with dynamic visualizations. To treat these media fluidly, they’ve assembled a team spanning backgrounds in architecture, music, theater, and digital media. They’ve taken as their canvas both epic sites – the Sydney Opera House’s signature sails – and the intimate, as in a sculpture atop the Four Seasons Hotel Beirut. More than just neo-Baroque optical illusion, their work now reimagines architecture as responsive and changing. If Goethe described architecture as frozen music, new audiovisual treatment unfreezes architecture again. It’s easy to imagine digital dystopias, to lament the rise of the machine. These artists offer a different, rebellious view. A global community that leads rather than follows is making a modern Renaissance, extending its poetic visions into every expression imaginable, all at once.